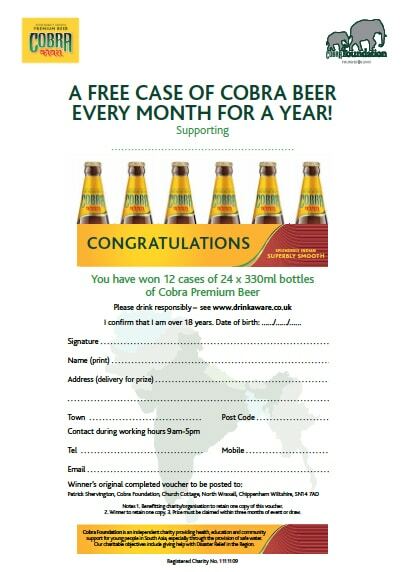 On behalf of the Cobra Beer Partnership we can receive applications for complimentary stocks of Cobra Beer. As for financial grants, stocks are only supplied if your objectives match our charitable mission. Our aim is to help your fund raising events by reducing your own costs. If we are unable to supply complimentary beer, we may be able to help your fundraising event by providing Cobra Beer at a special “community rate”. This is currently set at £18 per case (24 x 330ml bottles) of Cobra 5% or Cobra Zero plus a nominal charge for delivery. A Free Case of Cobra Beer Every Month for a Year! This is 12 cases of 330ml bottles (288 bottles) of Cobra Premium Beer. This is a popular prize for your fundraising event or other fund-raising activity. To apply for complimentary stocks of Cobra Beer please complete the online application form or download and print the pdf version [PDF, 53KB].